Winter hardy to USDA Zones 10-11. Grow as an indoor plant in the St. Louis area. Prefers diffused sun or good bright indirect light with consistent moisture from spring to fall. Plants thrive in warm temperatures with high humidity. Placement at a window facing north or east is a good location. Avoid placing in direct sun. Best performance occurs with a rich, well-drained, peaty potting mixture. This plant does not require winter dormancy, but appreciates a winter period of rest. Reduce watering from early fall to late winter, but do not allow soils to dry out. This indoor plant tolerates atmospheric dryness and somewhat shady locations. Normal room temperature with recommended 60 F. minimum winter temperature is recommended. Cold drafts may damage the leaves. Aglaonema is a genus of of about 20 species of herbaceous perennials from tropical Asia. Genus name comes from the Greek words aglaos meaning bright or clear and nema meaning a thread in reference to the stamens. Aglaonema 'Silver Queen', sometimes called painted drop tongue, is an evergreen perennial with a free-branching habit that typically grows to 24” tall. It is a very popular houseplant that survives well in low light. It is primarily grown for its attractive variegated foliage and not for its insignificant flowers. 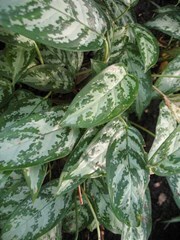 Thick, elliptic to lance-shaped, dark green leaves (to 4-6” long and 2-3” wide) with attractive silver-gray variegation appear on short stems rising from the soil. Leaves are silvery-white with green margins and veins. As the plant ages, it begins to develop a trunk-like stem as the lower leaves fall off. Flowers (typical arum family) appear on a small creamy white spadix topped with a greenish-yellow spathe. Flowers usually bloom in summer to early fall. Clusters of orange berries follow the flowers. Flowers and fruit are infrequently produced indoors. Houseplant for bright to moderatly bright areas.